Dr. Raymond A. Keller, a.k.a. 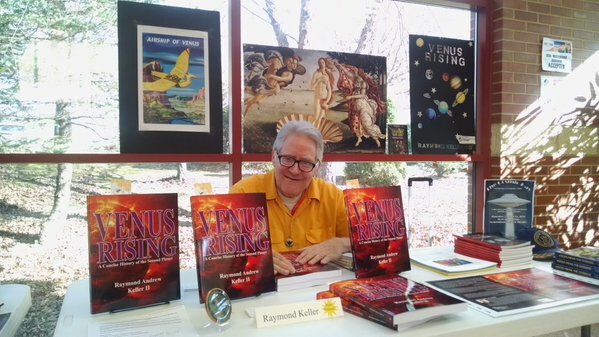 “The Cosmic Ray,” a retired professor of history, literature and mythology, will present a powerpoint and answer questions about life on Venus in various aspects along with its connection to the UFO phenomenon. If you ever had any questions about angels and aliens, the planet Venus or the Venusians, now is the time to get some answers. Dr. Keller is a long-time correspondent with the late ufologist Gray Barker, going back to the mid-1960s, and the author of the controversial, international awards-winning book, “Venus Rising: A Concise History of the Second Planet.” The professor recently came across an article from the National Enquirer going back 50 years in the Barker files that details his encounter with a flying saucer in an Ohio state park. He will autograph copies of the book and distribute flying saucer bumper stickers following the presentation. POC for additional information is the library staff at (304) 626-1473.